Bar and Bat Mitzvahs mark the time in a child’s life where they cross a bridge from childhood into adulthood and are a celebration of who they are and who they are becoming. We love the current trend towards personalization in all aspects of event planning, especially with this special group of party-throwers. What better time in life to proclaim to friends and family what makes you uniquely you? When choosing a theme for the party, consider the child’s pastimes, passions and favorite places and build from there. One of our most glamorous bat mitzvahs was for a young lady who loves the theatre. Table decor and place settings were themed around her favorite productions, movie theatre candy and snacks were served, and the dance floor came alive with tunes from well-known Broadway musicals. Party favors are a fun way to thank guests from coming and can be customized for your theme as well. One of our ski-themed mitzvahs for our mitzvah girl who is an avid skier featured the hotel ballroom transformed into a magical winter wonderland with gobos of snowflakes lighting the room and an igloo photo booth with some of her favorite ski accessories as props. As guests left the party they were treated to their own pair of cozy texting gloves to take home. There is no doubt your child’s event will be Snapchatted and Instagrammed by their guests. Why not come up with fun hashtags consider a personalized geofilter for the event? Get creative with your child’s nicknames and interests and be sure to involve them in the process. For tech help, go to https://support.snapchat.com/en-US/article/create-odg-snapchat. A fun way to mark your child’s big day and provide a great focal point for photo opportunities is with custom signage and paper goods. We can help you create sign-in boards with their name and photo, put their name literally up in lights, and customize large dance floor stickers with their name or monogram. We can connect you with reputable stationers and walk you through the process of designing beautiful invitations, place cards and menus to match your theme. 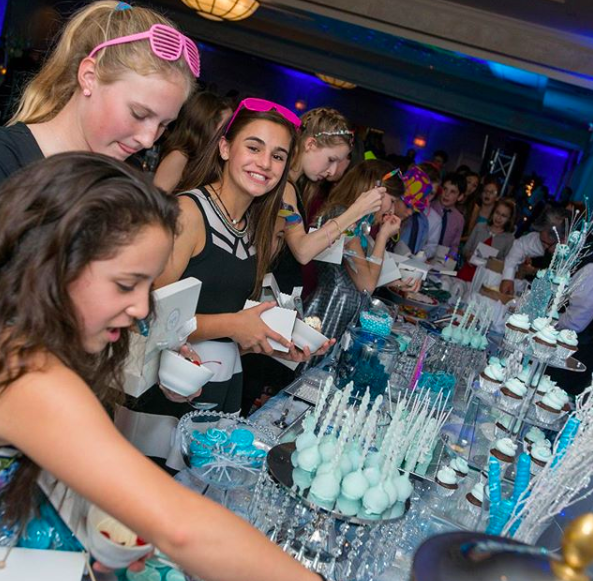 At ARJ, we are delighted when our mitzvah kids are happy with the outcome of their parties and can relax and celebrate with friends and family. We work hard to make it a day everyone will enjoy and remember for years to come. Let us help you design a party that represents all that makes your child uniquely them.